I am obsessed with egg salad. I love it so, especially with a tablespoon of pickle relish. Yum. Here, I used some asapragus stalks and chives from my garden to make a crunchy springtime version. You've seen these here before with smoked salmon. Either or, it's your call. Perfect appetizer for your Mother's Day brunch. 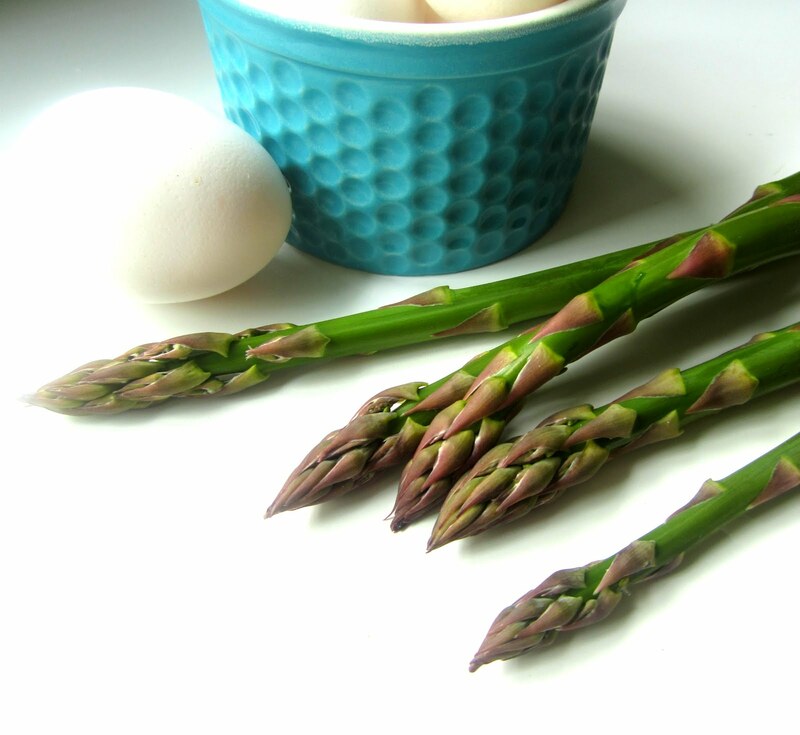 I steam my asparagus for a minute before slicing, but since these spears were freshly picked from my garden, I used them fresh and crunchy (don't do that with store bought asparagus, different animal). 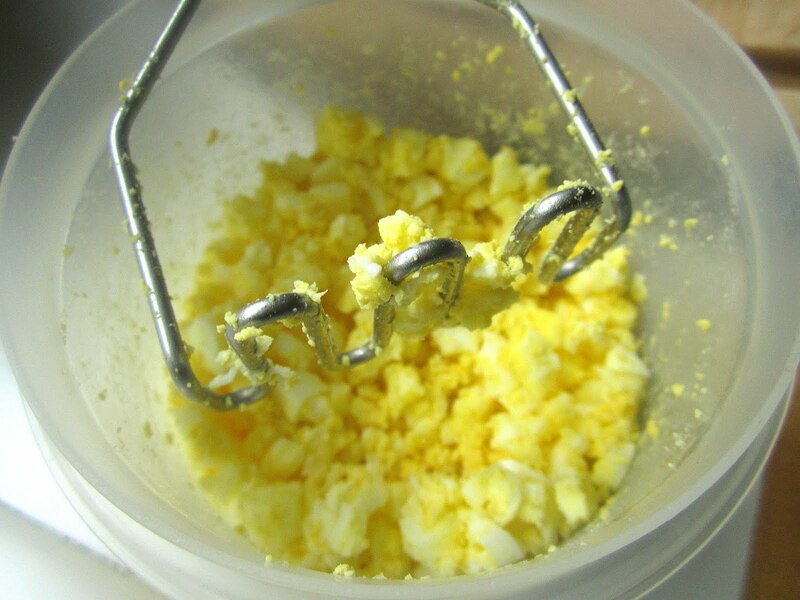 Mash your eggs with a potato masher or fork and add the rest of the ingredients. Fold in the steamed asparagus pieces, saving the tops for decoration. 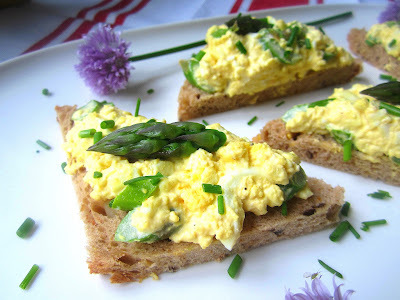 Spread the asparagus egg salad mixture on the crustless bread pieces (tartines), and cut in half to make 8 slices. 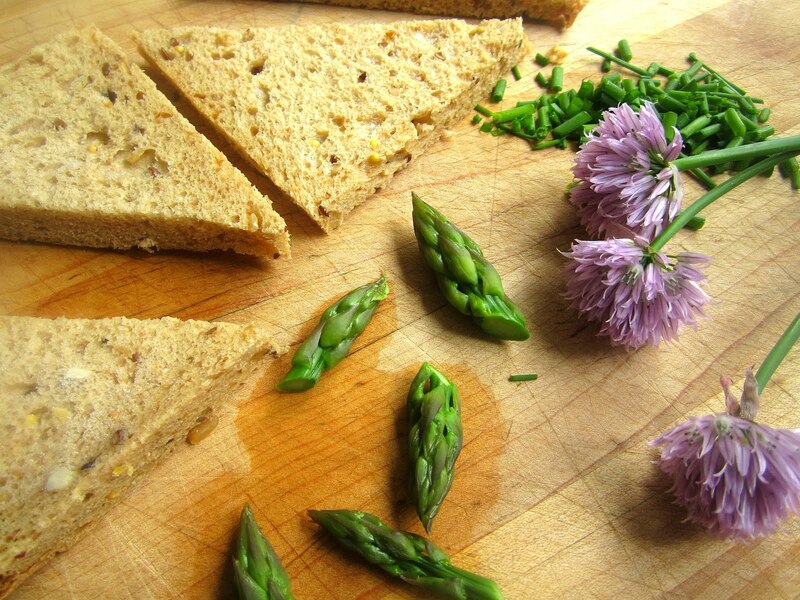 Garnish each tartine with an asparagus top and some fresh chives. What a lovely sight on first awakening! Your tartines are a work of art. YUMMY!! A very yummy looking bite. Add dill to the egg salad. It will change your life. I love dill, but never seem to have any on hand, and it never seems to do well in my herb garden! But Dil, does Mil love dill? Happy Mother's Day to you TWO too! Yes, Mil loves Dil very much. She is a wonderful daughter-in-law and friend. Yes, Mil loves dill and has a bunch in the fridge as I type. Love it in tuna salad. I don't like DILL, I like pickle relish in my egg salad! I've been thinking lately about doing a tar tine post myself as eating them is one of the things I miss most about not living in Paris anymore. 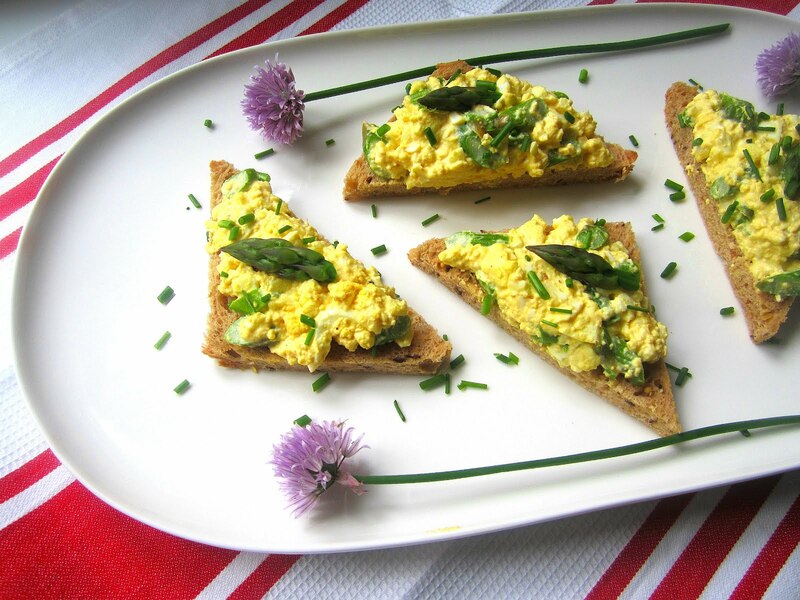 I've never been a huge fan of egg salad, but this dish could turn me. This is definitely my kind of breakfast, lunch or brunch! It definitely has the spring feel to it. Those tartines look beautiful and delicious. I love eggs in general and I certainly wouldn't mind waking up to these sweeties in the morning. Based on your delicious Egg Salad & Asparagus Tartines photos, we'd like to invite you to submit your food photos on a food photography site called http://www.foodporn.net so our readers can enjoy your creations.